This post is much curtailed, due to the fact that I wrote it once and then managed to delete the whole thing. So the following is a kind of ‘Previously, on ANBAD…’ round-up. Apologies. It probably wasn’t that good anyway. Have you noticed how hefty singers like Barry White, Aretha Franklin and SuBo also sound chubby on their records? Their voices practically drip with bacon grease. It occurred to me this week that roly-poly BRIT-school faux-soul Bellower Of Blandness Adele can be added to this inglorious list. Adele is a woman whose MOR dirge is enlivened only by the fact that if you listen to it carefully, you can hear the patter of melted butter landing on the studio microphone as it sprays from her lips. FIRST! Mackaper are not MacGyver, but then I’m not sure I’d want to listen to the sound of a man solving crime with the aid of elastic bands and bent coat-hangers. Mackaper, on the other hand, make lovely, ice-cold thin-fingered pop. SECOND! The Dead Beggars Club mark a return to the sort of monster-chord, giant guiatr pop that would never have been accepted by the masses even two years ago. Oh, time, you fickle mistress. Nice. THIRD! Muddy Suzuki: puns-a-plenty, PLUS – Prog, buzzsaw punk and lo-fi pop all in the same song. An acheivment. Posted on February 9, 2011 by Joe Sparrow. 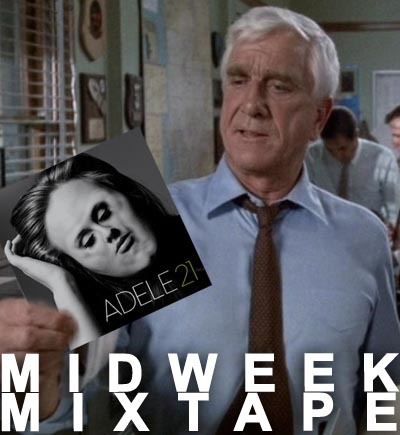 This entry was posted in Headline, Today's New Band and tagged Midweek Mixtape. Bookmark the permalink. I like the first one best of all. I also love the name Honheehonhee, and was quite into their song, but i’d prefer it to be a bit less generally noisy (cymbals etc) and to have the vocals slightly higher in the mix. Nice, thanks! Buttered microphones! A recording I’m working on needs some of that fat slap. Thanks for that image.